The dispute in Britain's universities is entering an intense stage, with the employers seeking to sow division at every opportunity by focusing on whip-ping up student and parent opposition to the dispute rather than negotiating with the unions. The employers are also seeking to sow division between academic and administrative unions by falsely claiming that Unison is satisfied with the pay offer to administrators. On Monday 8 May Natfhe and the AUT rejected the long-awaited "final" pay offer from the university employers. The offer – only 3.5% for three years – fell far short of the claim (23% over three years) and was even less per year than the guaranteed funding increase of 5.8% that institutions in England will receive in the 2006/7 teaching and research grant. Unions also pointed out that the offer utilised almost none of the new income from tuition fees for basic pay increases. An additional caveat included in the offer was for "institutions in severe financial difficulties to be able to defer full payment by up to 11 months". Since the rejection of the offer some individual employers have issued threats to stop 100% of the pay Northumbria and Bournemouth Universities staff who are taking part in the action short of a strike by boycotting assessment. A mass meeting at Northumbria has already voted to strike. Meanwhile in Scotland the Educational Institute of Scotland, which has not been involved in the action to date, has voted to ballot immediately on action short of strike. 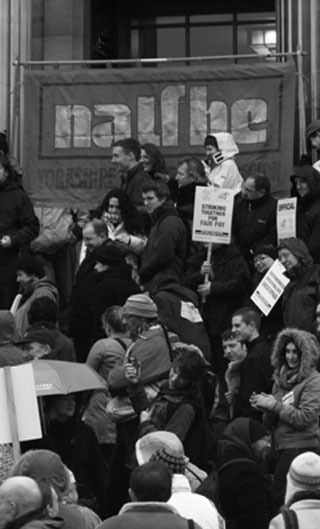 The current struggle marks the mature emergence of the academics as a trade union. For too long they have almost apologised for being "privileged" to be academics; embarrassed to seek higher pay. Now, in keeping with their true position as the leading force in universities, they have taken the lead. Paradoxically, the support staff, mainly in Unison and Amicus, who have spent years berating academics for not supporting pay struggles, are standing on the sidelines. Whatever the excuses, the fact is that the other staff groups are quite happy to allow the academics to fight and then claim any increase won because of the single pay spine. Ethics aside, this is extremely foolish. A concerted effort is much more likely to prise some of the "new money" from fees out of the hands of the employer. Hopefully, a decision to join in will come before the new term starts in September. • Unions at London Metropolitan University are balloting members on a vote of no confidence in the Vice Chancellor and the Director of Human Resources. London Met was created in 2002, from the merger of the University of North London and Guildhall University, amid claims of future expansion, financial security and academic development. Now, less than four years later, the university is facing a projected deficit of at least £10.5 million and is going through a second round of voluntary redundancies with the imminent threat of compulsory redundancies to follow. Natfhe and Unison have suggested that bonus payments and new appointments be suspended to head off the need for compulsory redundancies but this has been rejected. This from a Vice Chancellor on an annual salary of £214,000, one of the biggest in higher education, following an increase of 35% in the past three years!